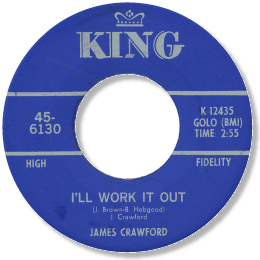 A member of the James Brown Revue for several years, Crawford is one of several artists who were so mesmerised by the Great Man’s personality and success that they attempted to make their vocal styles indistinguishable from the real thing. 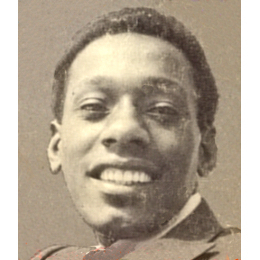 He came from Toccoa, Georgia where he sang with a young Bobby Byrd in the Gospel Starlighters, and where he may have started his involvement with JB. Crawford never really mastered James’ crude “rasp”, having a naturally purer tone to his voice, but his sense of timing and dynamics are straight Brown. No doubt the presence of Brown sidemen like Nat Jones - not to mention James' own production skills - reinforced this tendency. He cut some funk/boogaloo tracks of course, like “Much Too Much”, “Help Poor Me” and “Honest I Do” but also recorded some really cracking ballads. Strung Out was the first, a simple but very effective song. A great plodding bass line, piano triplets and subdued horns back Crawford up as his voice cracks with emotion – lovely. Stop And Think It Over is another first rate performance, over a stop/go structured ballad, with minor keyed chord changes and a sympathetic string section. Think Brother James on “Man’s Man’s World” and you’ll be in the right territory. 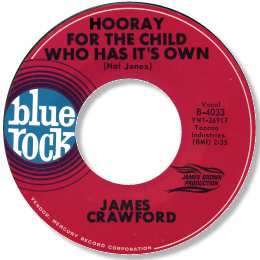 Hooray For The Child Who Has It’s Own is fine deep soul as well, the “climbing” horn chart and arpeggio piano giving Crawford room to show his abilities. I’ll Work It Out may just be the best of the bunch though. For my money it’s his most committed and emotionally compelling effort, and the backing is just magic, with the guitar and horns meshing to superb effect. 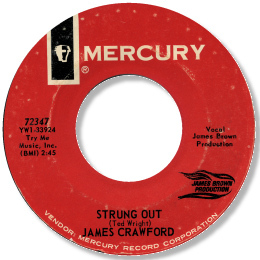 Note: James Crawford has 4 tracks on the "live" LP "Presenting The James Brown Show" (SMASH MGS 27087) from 1967 - "Wait Till The Midnight Hour", Stop And Think It Over", "634-5789", and "Strung Out". The two deep tracks sound very much like remixed, slightly longer versions of the 45s with overdubbed crowd noises. Thanks to Michel and Davie Gordon for info, and to Pete Nickols for the photo.